Erstelle Sommer Erinnerungen an dieses charmante 2-stöckige Ferienhaus im Jahre 1875 gebaut. Es liegt auf Mona Lake in der Nähe des Kanals, die dem spektakulären Lake Michigan und 1/2 Meile von der Maranatha Conference Center verbindet. Dieses Haus wurde im Jahr 2006 mit bemalten Kiefernholzböden, wulstige Kiefer Wände, und die kleinen "Extras" wiederhergestellt, die diese Hütte Gefühl abzuschließen. Tagsüber genießen Sie die See alle Sportarten von Schwimmen, Angeln, Kanufahren, Segeln und Motorboot fahren, nehmen Sie Ihr Boot in Lake Michigan oder einfach nur entspannen auf der großen Wrap-around-abgeschirmten Veranda mit Blick über Mona See. Am Abend entspannen Sie am Strand Feuerstelle oder im Inneren und gemütlich-up zu einem der zwei offene Kamine Schritt. Während Sie diese reizende Landhaus lieben, werden Sie müssen nicht modernen Annehmlichkeiten wie eine Waschmaschine / Trockner, Geschirrspüler, TV mit DVD und andere Annehmlichkeiten verzichten. Bitte E-Mail oder rufen Sie bei Fragen. Maranatha :: Maranatha Bibelkonferenz ist 1/2 Meile entfernt. Old charming lake house directly on the lake. We were 4 adults and 5 children and enjoyed every minute of our stay. Lots of things to do for children inside and outside the house. We spent every morning and afternoon on the amazing porch looking directly at the water and shady trees. Lake Michigan is very close and the kids loved the public beach with playground. We will definitely recommend the house to friends. 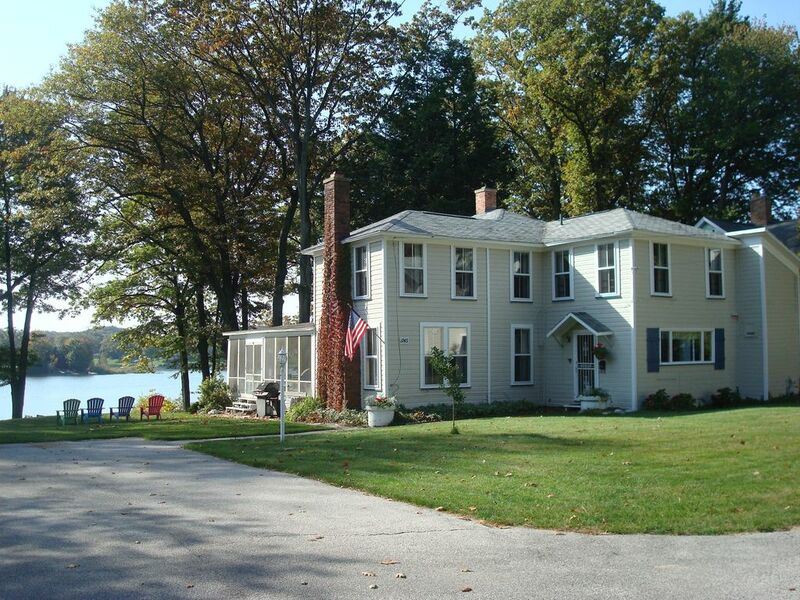 We enjoyed out nice large home on Mona Lake. Beautiful weather, warm lake w/lots of fish for cooking. If you go, I would recommend going to Parrot's Bay for Jeep dune riding- a real thrill like going up & down 2 hours of rollercoaster riding!! Excellent value for the money, beautiful place! We were very nervous, considering we had never rented in the area before. We shouldn't have been. The owners are very nice and helpful, and I could not believe all of the amenities included in the price! We had nine people, too, and there was plenty of room for us all to spread out. The one thing I will mention is that one of our party is partially disabled due to a severe knee problem. The owners were very helpful, and the property was beautiful, but it was a little tricky for her to maneuver. Also, the bikes listed as an amenity are children's bikes, just an FYI. All in all, though, this property has so much to offer that it actually got our teenagers away from their video games and out with the family. We caught some great fish, took beautiful scenic hikes, met some wonderful neighbors, and cannot wait to come back! Our family of ten,( 7 adults and 3 small children) enjoyed a delightful week relaxing in this amenity-filled lakeside home. The beautiful tree-lined drive leading to the property opens to a wide expanse of lawn which then gently slopes to Mona Lake. The house is just charming. Its charm is truly in the details of this home. Everything about it is comfortable, from the furniture to the tableware and lighting. The kitchen is well-equipped and spacious. The downstairs bedroom is perfect for a grandparent or two teenagers, as it has a hide-away bed beneath the single. All of the bedrooms are comfortable and have adequate storage. One bedroom is not pictured and is a connecting room to the one with crib and futon. These two rooms were perfect for a couple with two small children, yet it were private as well. The two living rooms with fireplace and t.v. provided many options for board games or art activities. The most delightful feature of this house is the oversize wrap-around screened porch. Filled with comfortable wicker furniture and table-seating for ten, we enjoyed lovely sunset dinners there every evening. In addition, this house is not only children-friendly, it is children-welcoming. The owners, Bob and Ruth, could not have been more gracious, and we are already looking forward to another family retreat next summer. We fell in love with this house and it's location as soon as we pulled into the long, tree lined driveway and saw 6 deer just relaxing. Then we walked into this super pretty home........The pictures do not begin to describe the beauty and charm that this home has! It is a perfect old stunner, right on the beach, with the BEST huge wrap around (enclosed) porch! We just got back today from 4 nights, there were 12 of us and we were completely comfortable with plenty of room. The house is older but well taken care of and just beautiful. We would have been happy just to stay there but we did visit many great area sites too. The owners are so kind and accomodating and everyone we met in their family was the same way! We will go back every year as long as these great people will have us!! Best features: The porch ( we were always out there), being on the beach (with chairs, boats, ect), the beauty of the home, and location (close to everything but private)!!! We are already picking our dates for next year! We had a great time. It was a beautiful place with enough room to accomadate our whole family. The wrap around pouch allowed us to sit and relax and just enjoy our surroundings. The kids enjoyed the jungle gym and the lake being so close. The house itself is beautiful. Everyone had their own space. I would reccomend this cottage to anyone that asks. The place was clean,bright and well maintained. 1/2 Meile von Maranatha Conference Center, 20 Meilen von Cedar Point im Besitz Michigan Abenteuer, 4 Meilen von der Hochgeschwindigkeits Cross Lake Fähre nach Milwaukee, vielen nahe gelegenen Golfplätze, 5 Meilen zum The Lakes Mall regionalen Einkaufszentrum und viele, viele andere Aktivitäten.